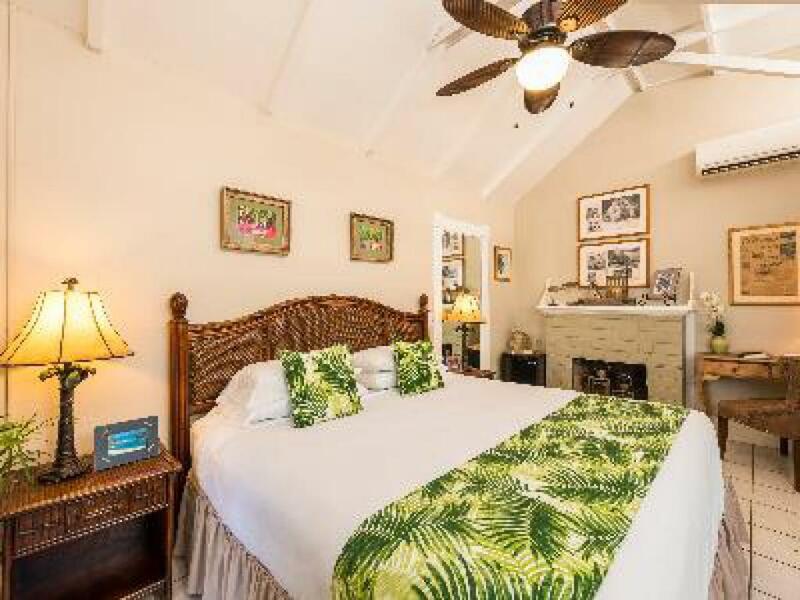 Featuring cathedral ceilings, ornamental fireplace and bright tropical accents, you’ll be surrounded by comfort and luxury in this spacious room. 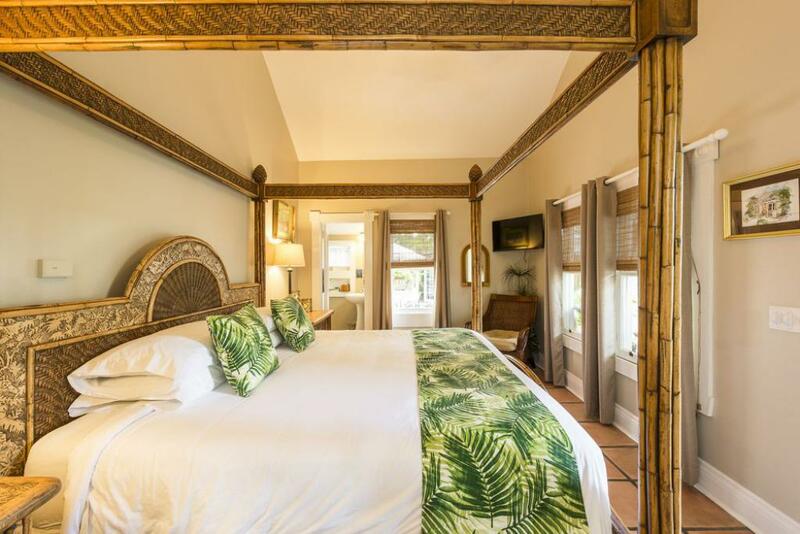 Madrid features a King size bed, private bath and French doors opening to a poolside terrace. 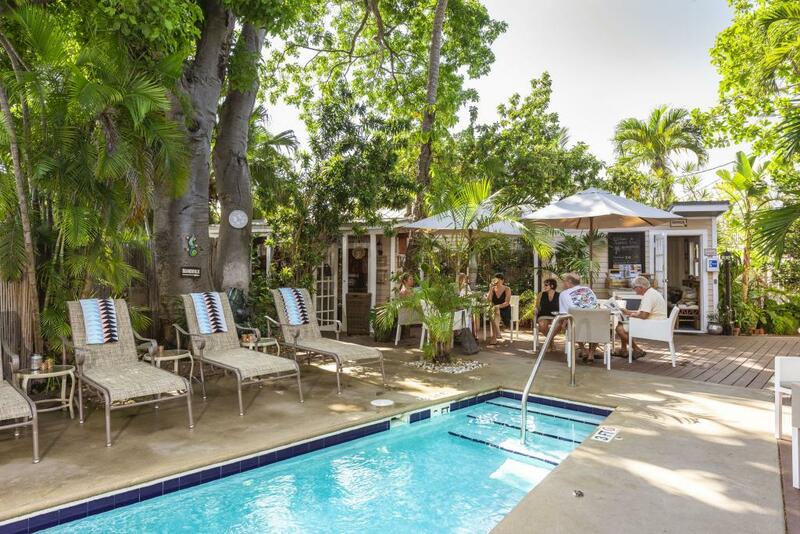 Breakfast & Happy Hour are included in the nightly rate. 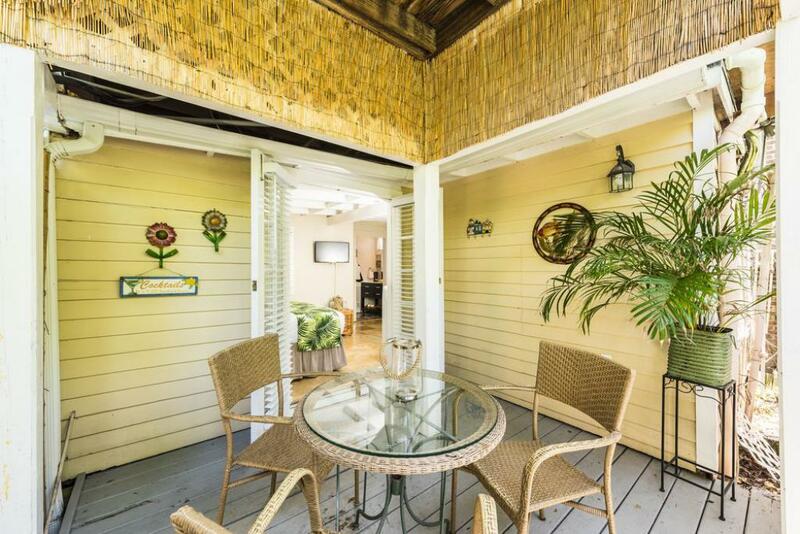 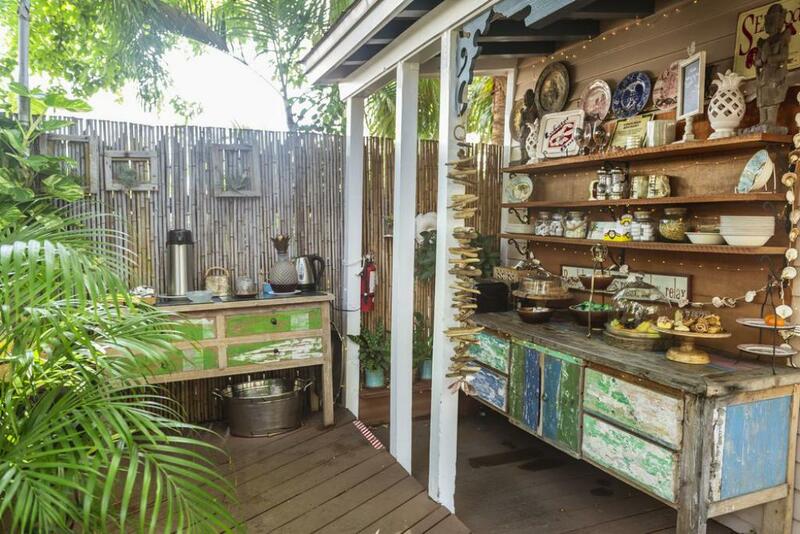 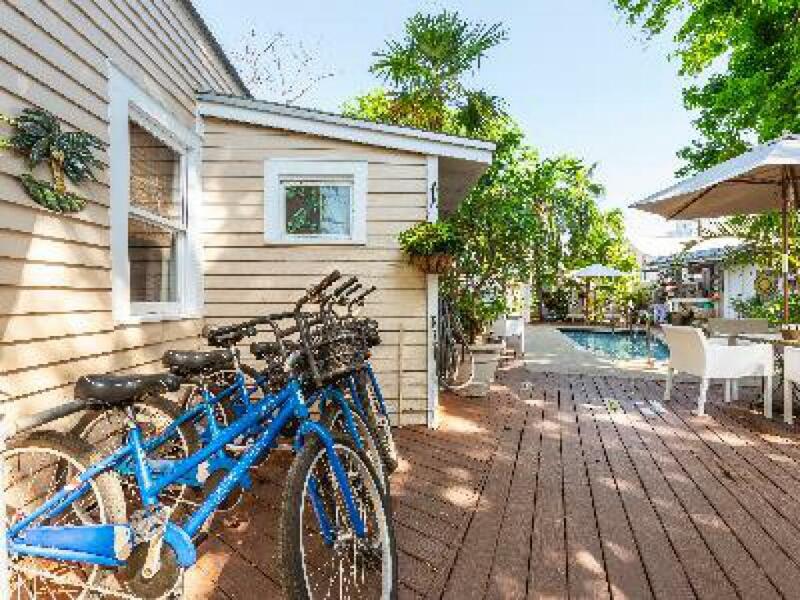 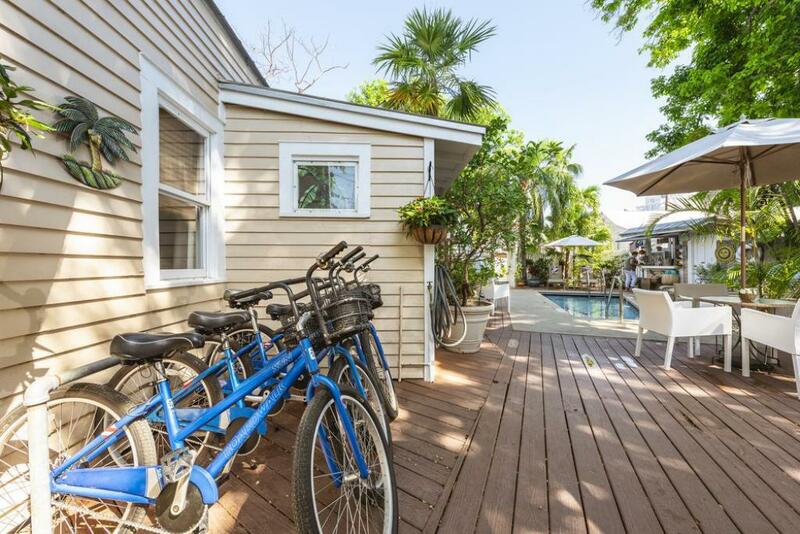 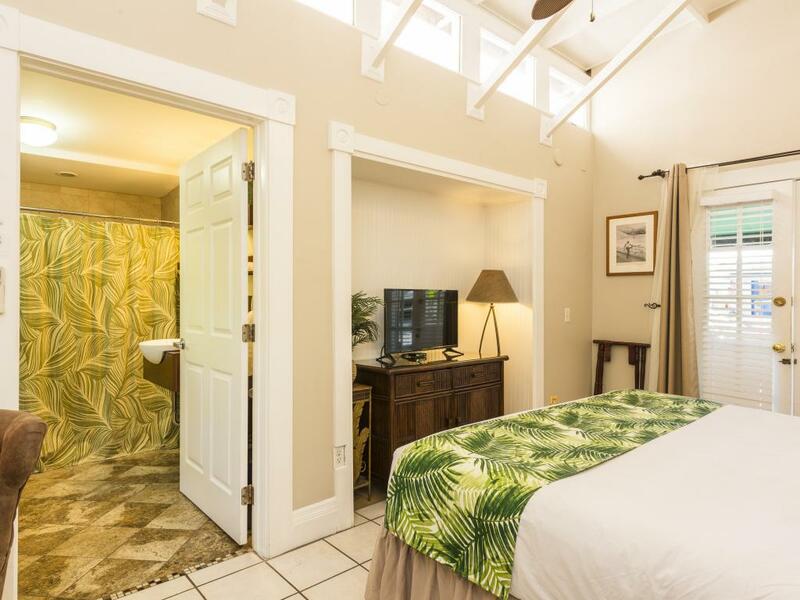 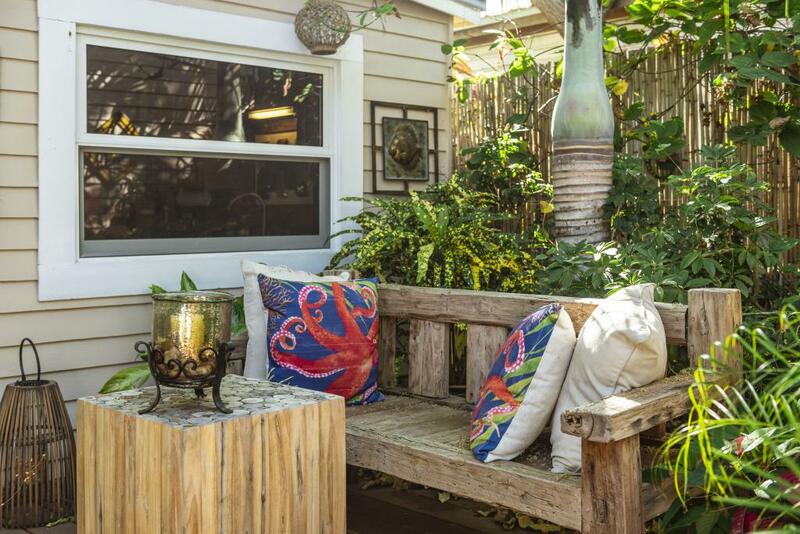 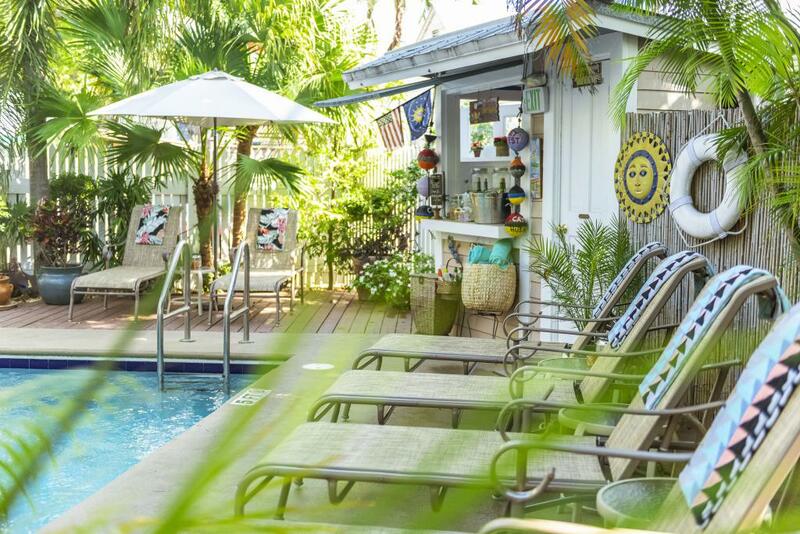 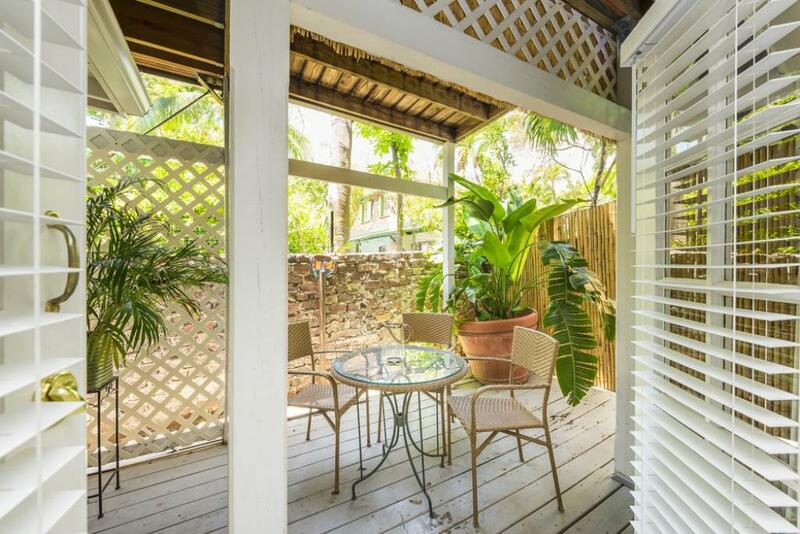 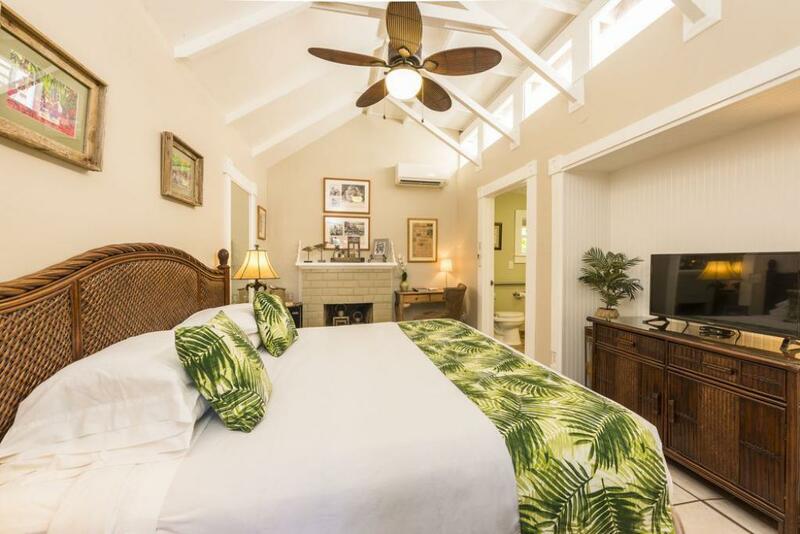 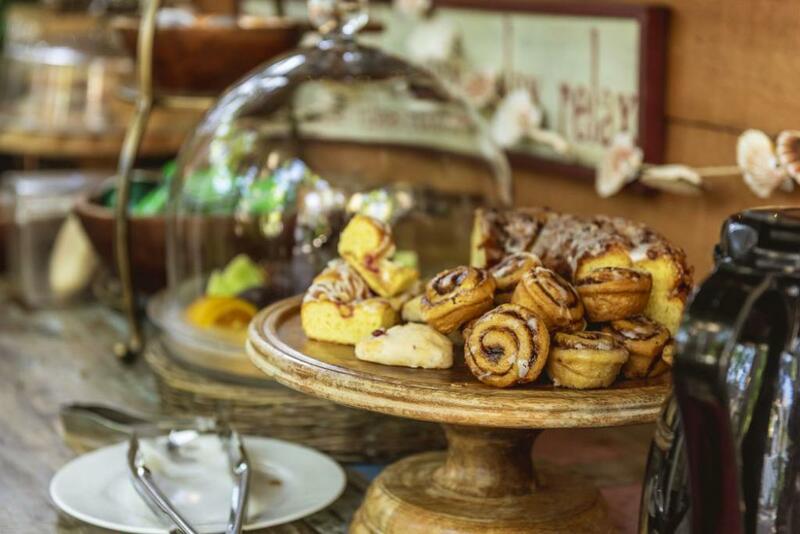 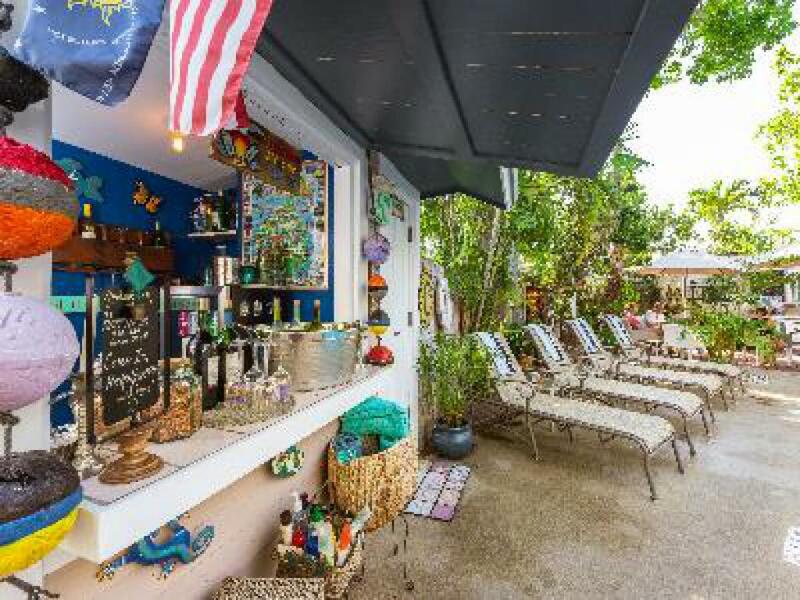 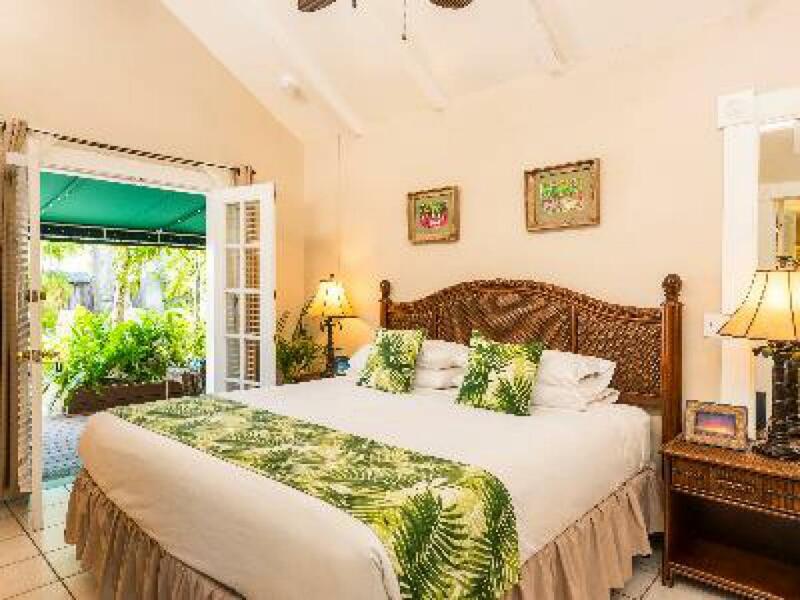 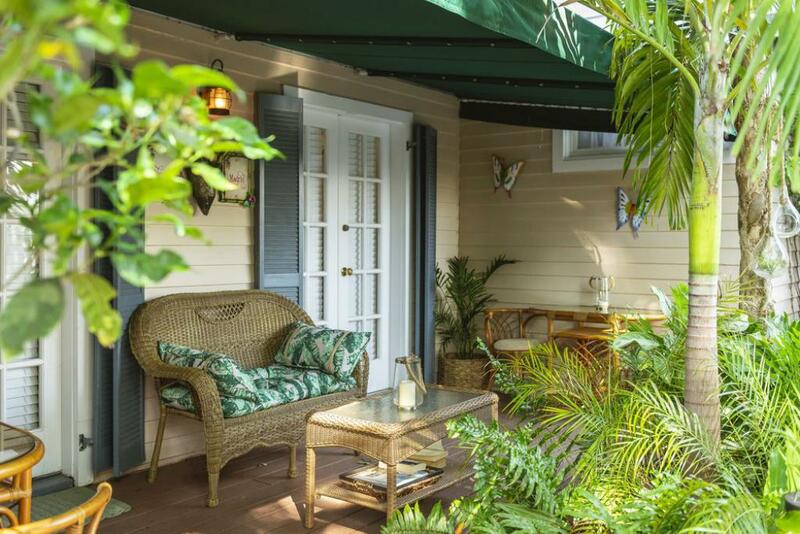 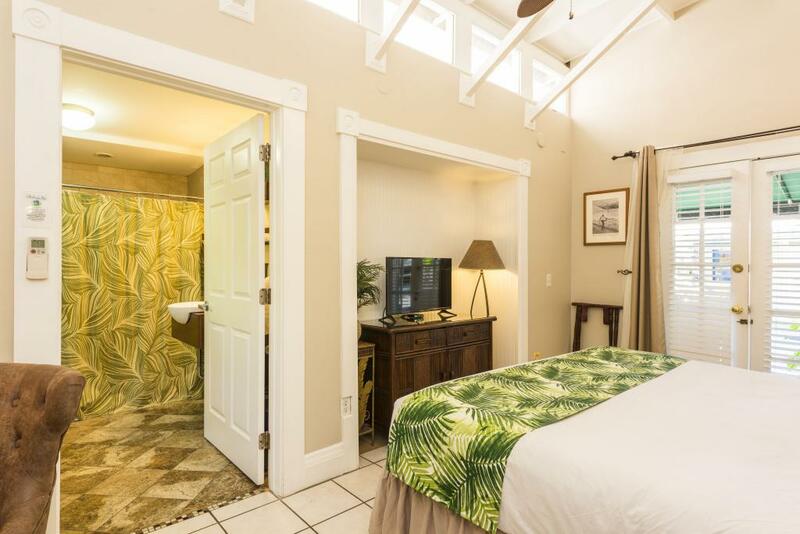 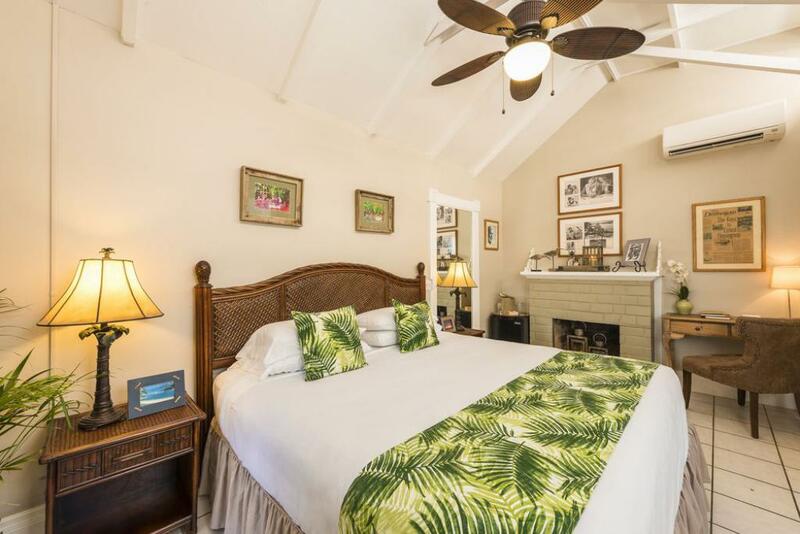 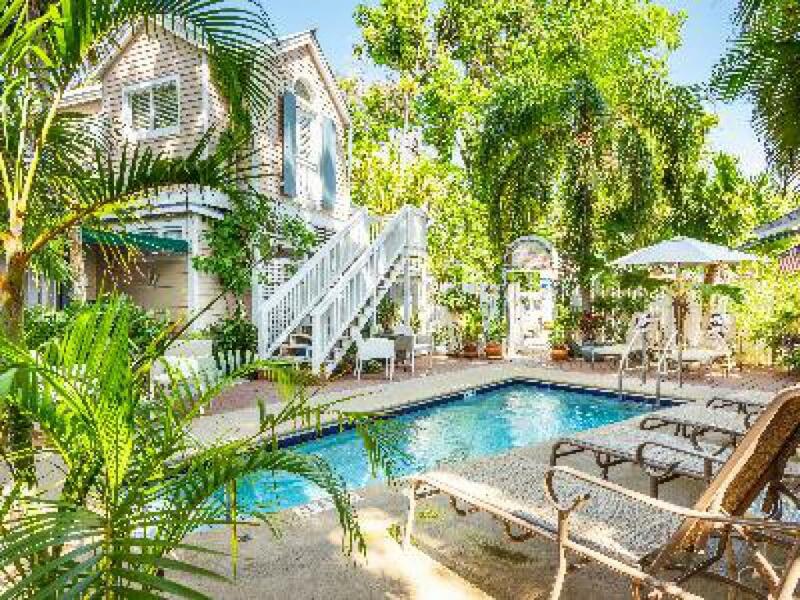 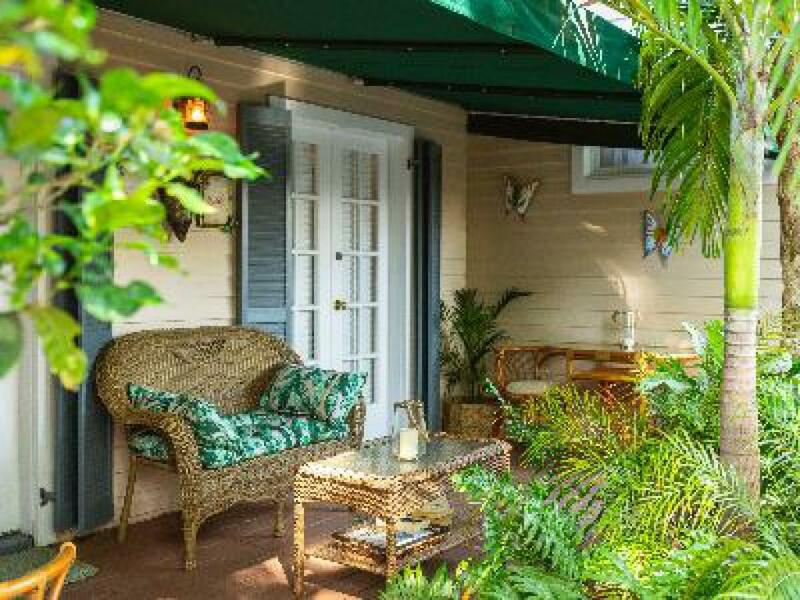 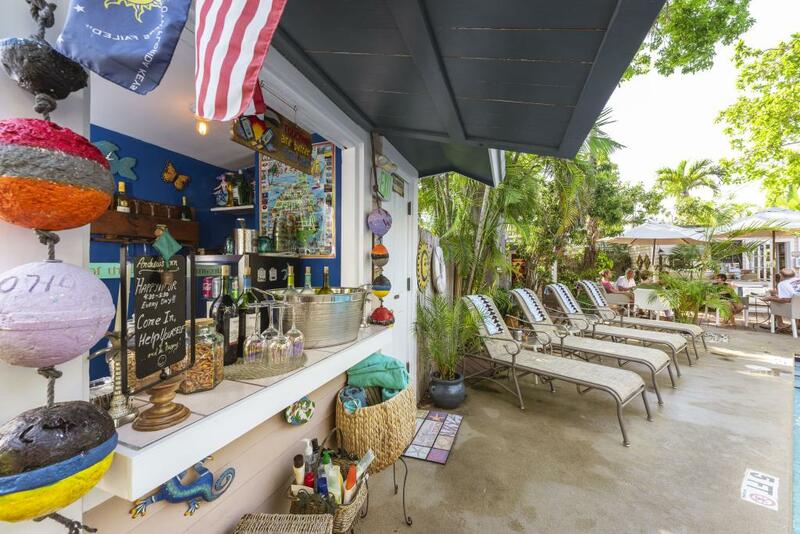 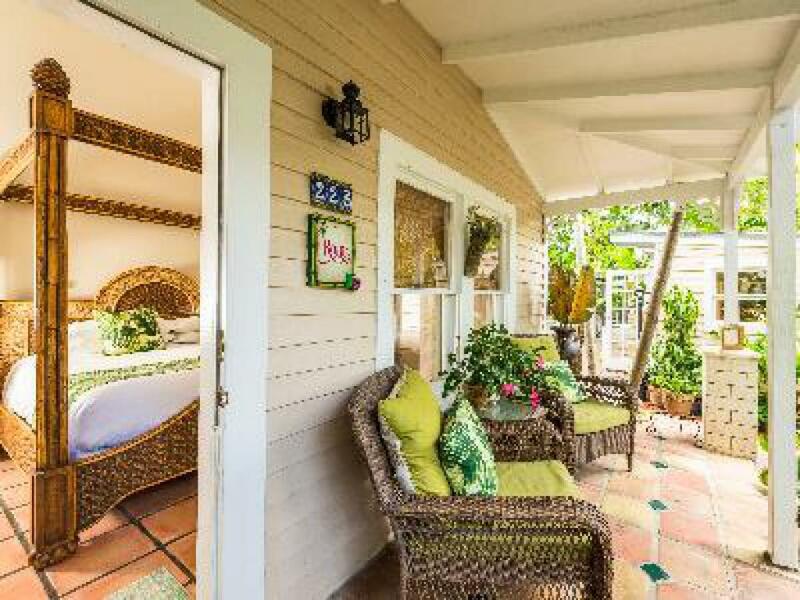 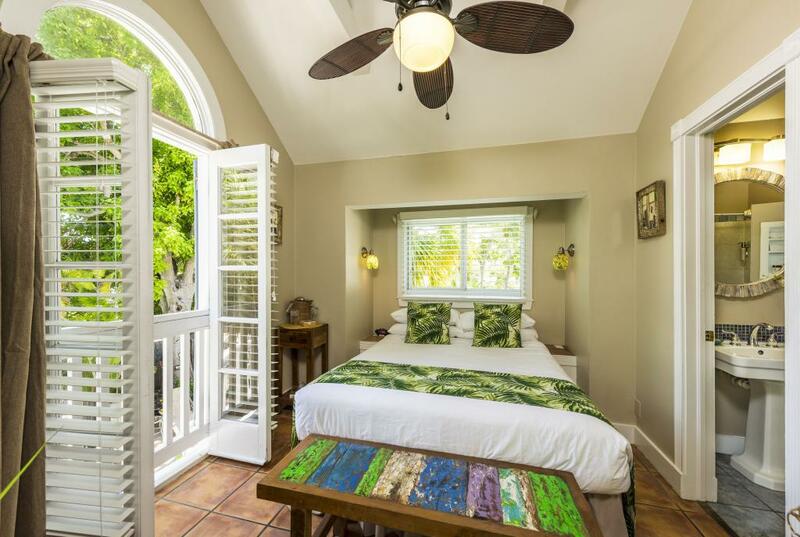 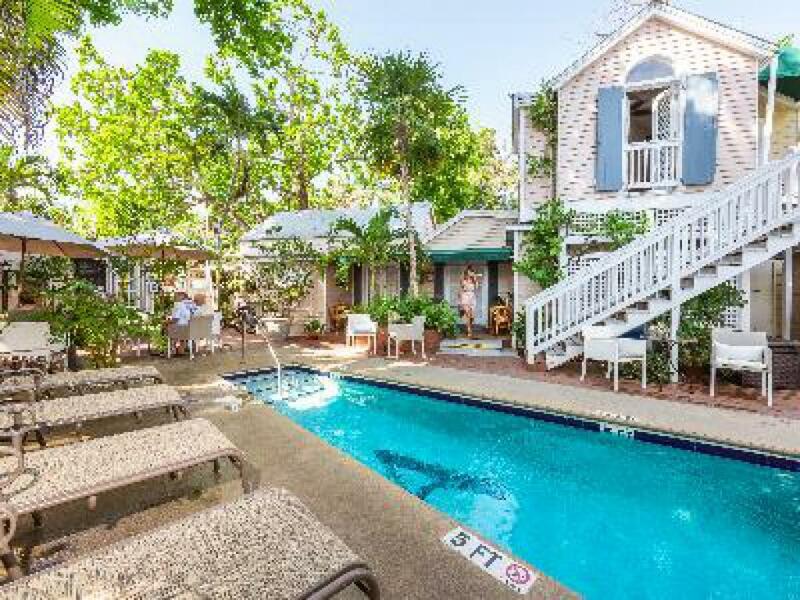 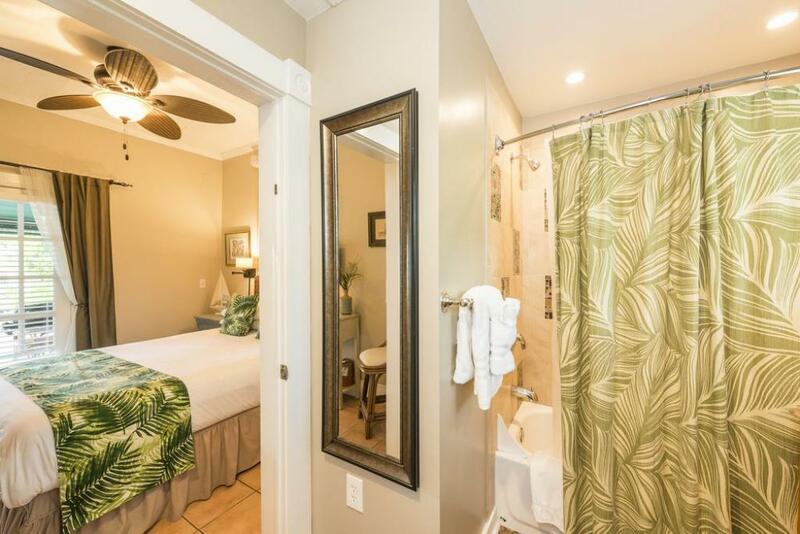 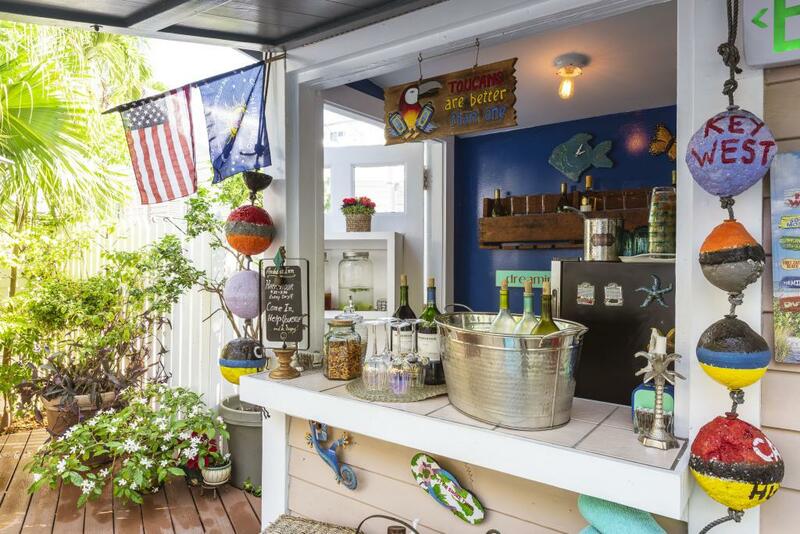 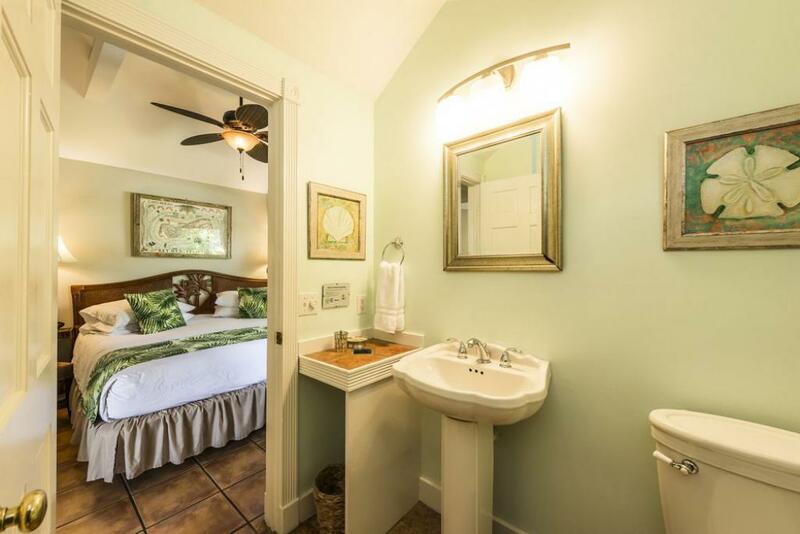 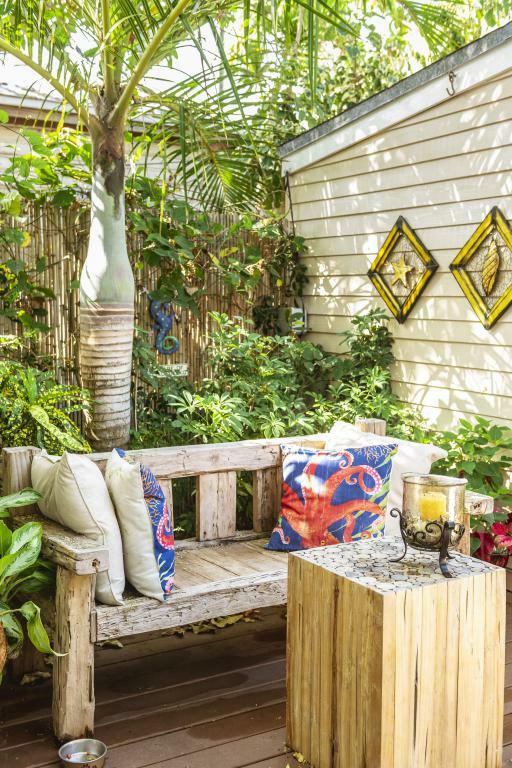 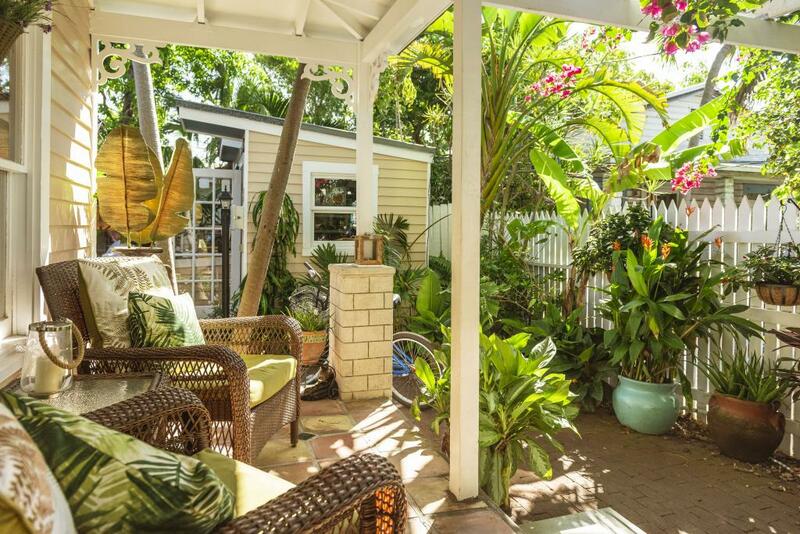 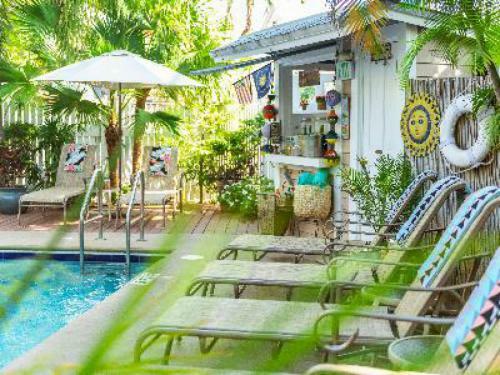 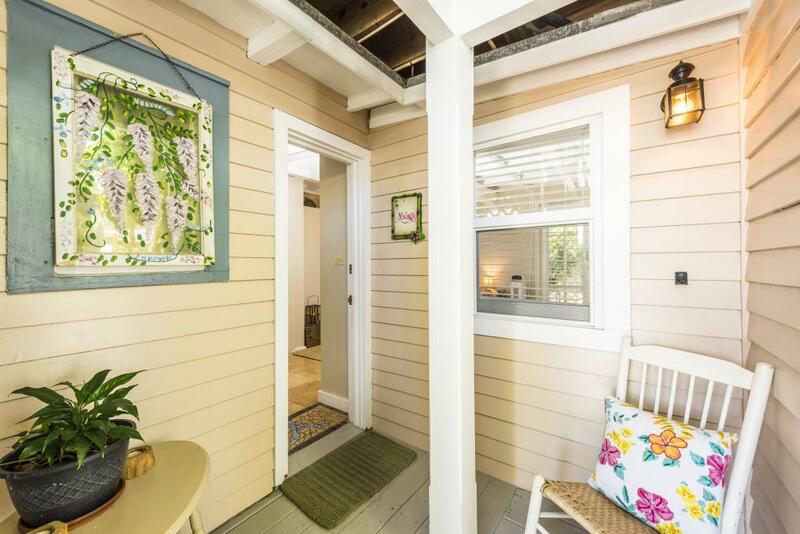 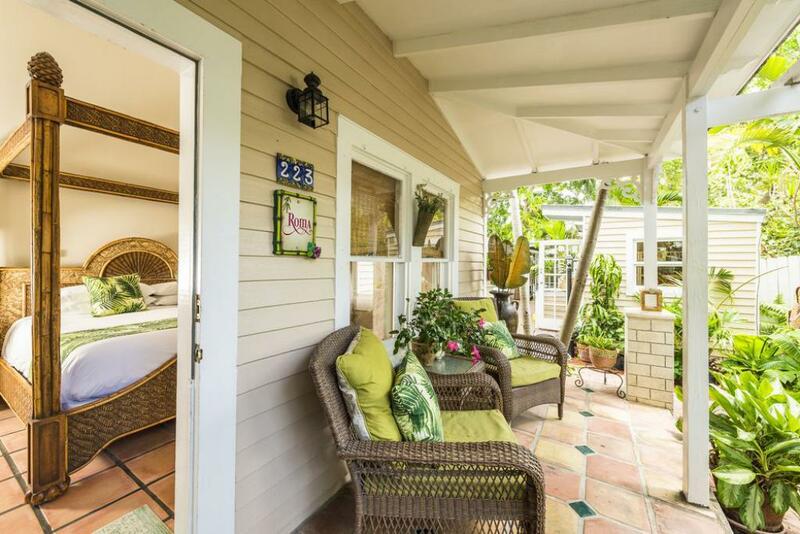 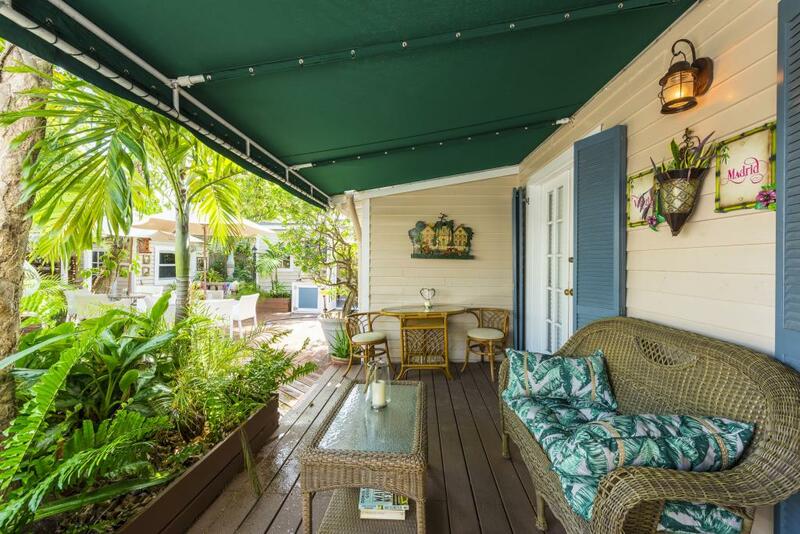 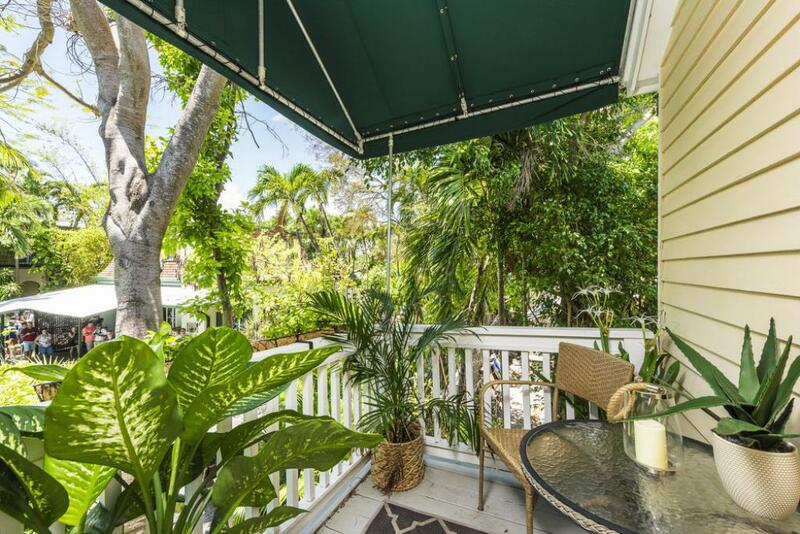 To reach this charming bed and breakfast, you wander down a shaded lane steps from Duval Street. 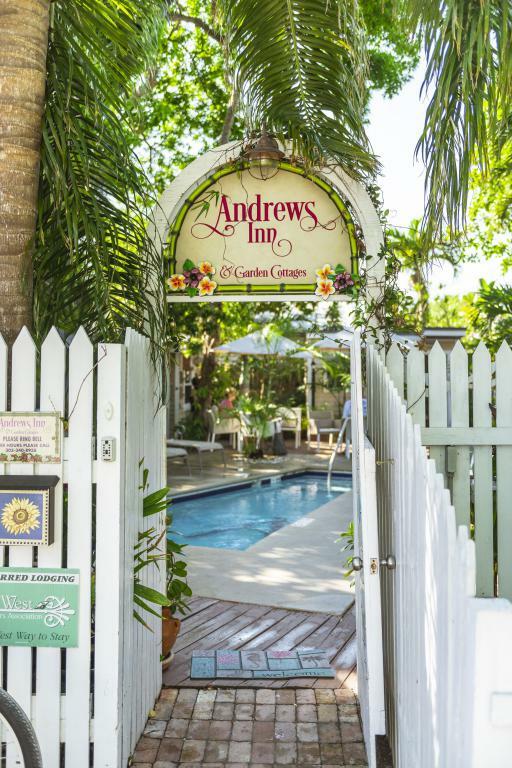 Andrews Inn immediately offers peace and tranquility as you enter through a garden gate to our secluded world. 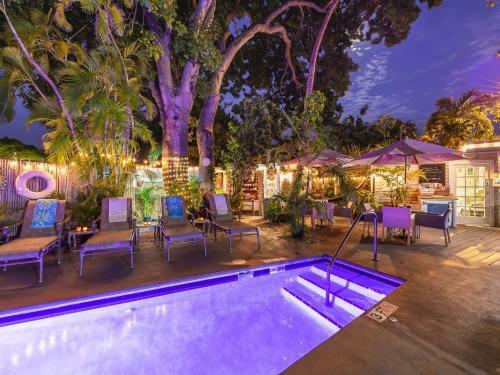 A shimmering pool is nestled in a lush tropical garden of coconut palms, Spanish lime, hibiscus, and jasmine. 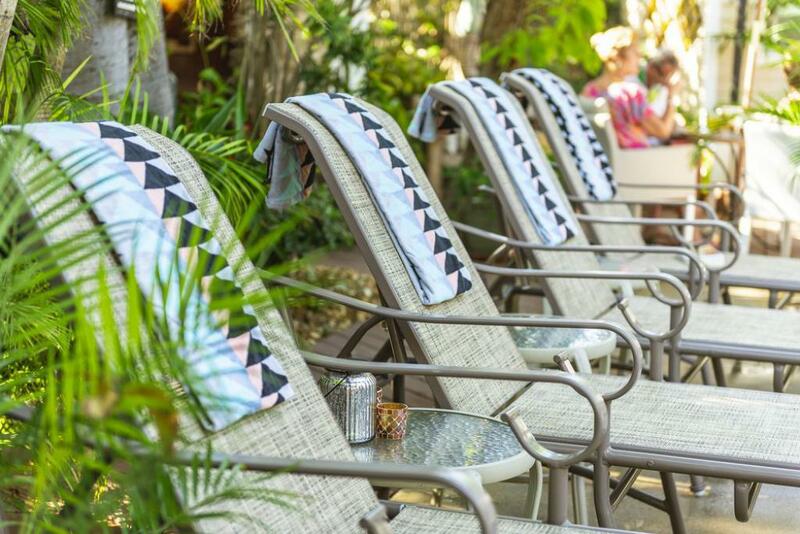 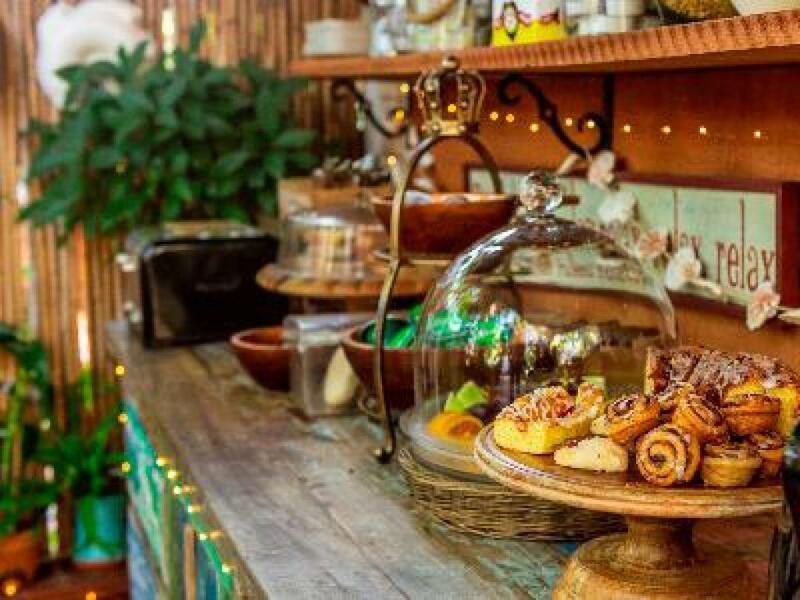 Enjoy a laidback breakfast served alfresco including a selection of warm and cold delights, as well as traditional Key West champagne cocktails. 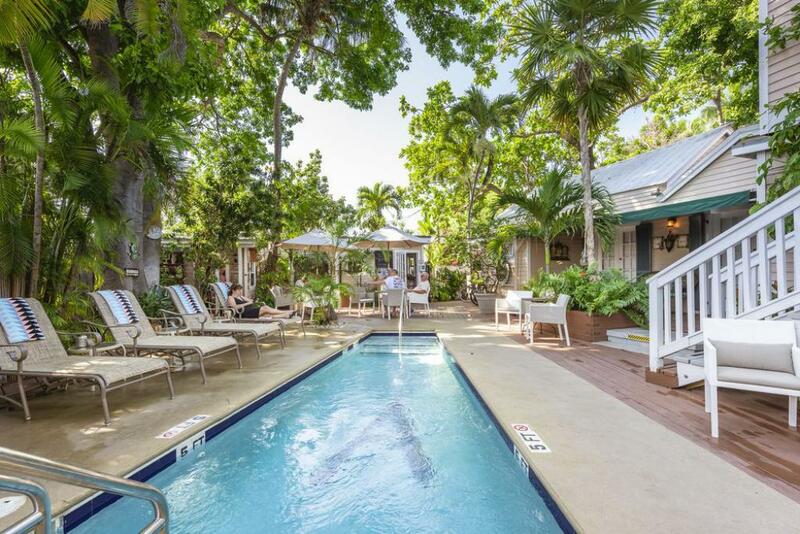 In the afternoon, chill out by the pool with a complimentary pre-dinner drink. 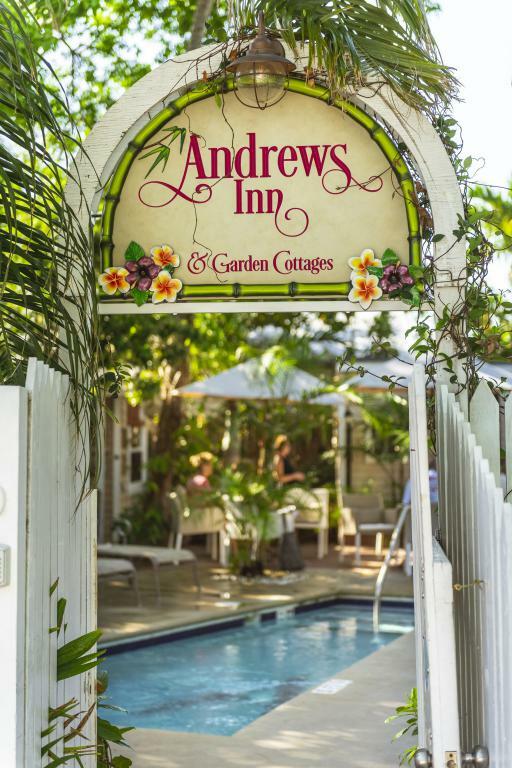 We proudly carry-forward decades-old tradition of a complimentary happy hour which has earned Andrews Inn the title of the “happiest happy hour in town”. 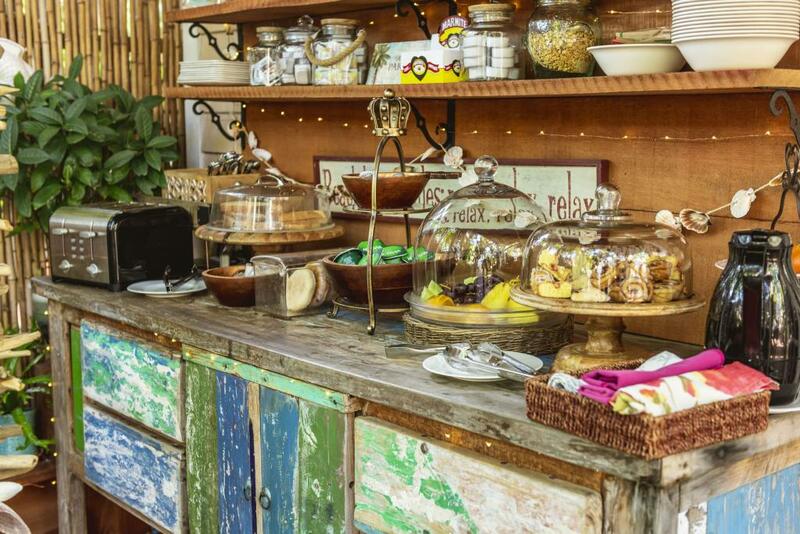 Other wonderfully hospitable touches include free ice tea, citrus water, snacks and fruit. 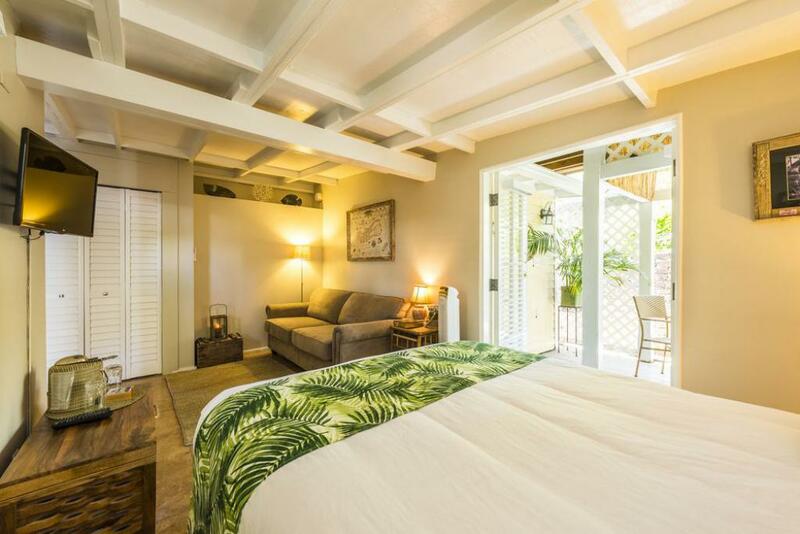 We also offer free parking and concierge services. 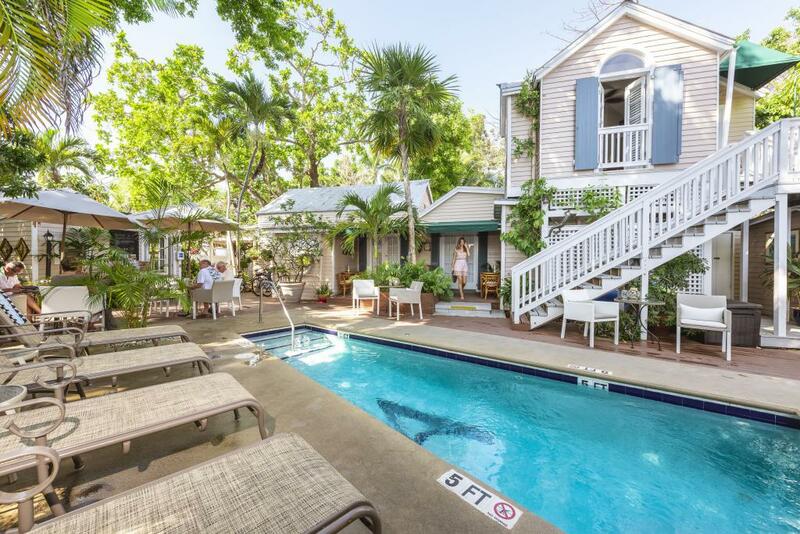 Andrews Inn is proud to carry a TripAdvisor Certificate of Excellence, a Two-Palm Designation in Florida’s Green Lodging Program as well as a TripAdvisor GreenLeader. 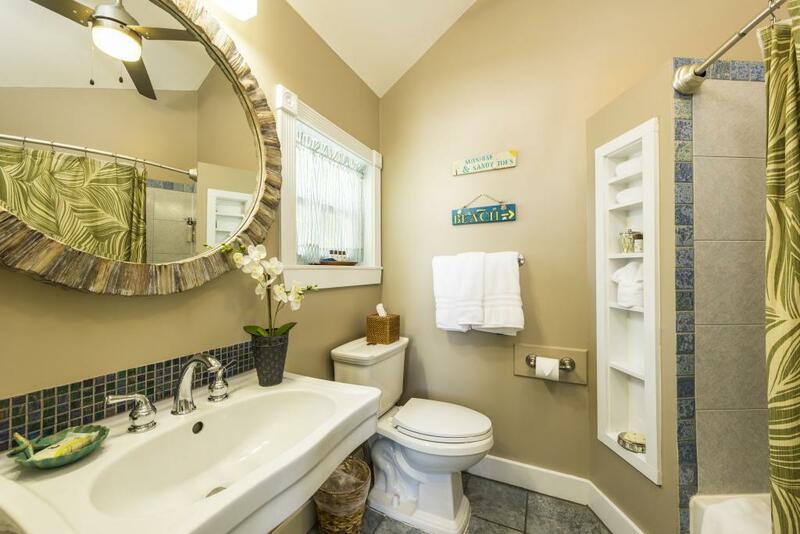 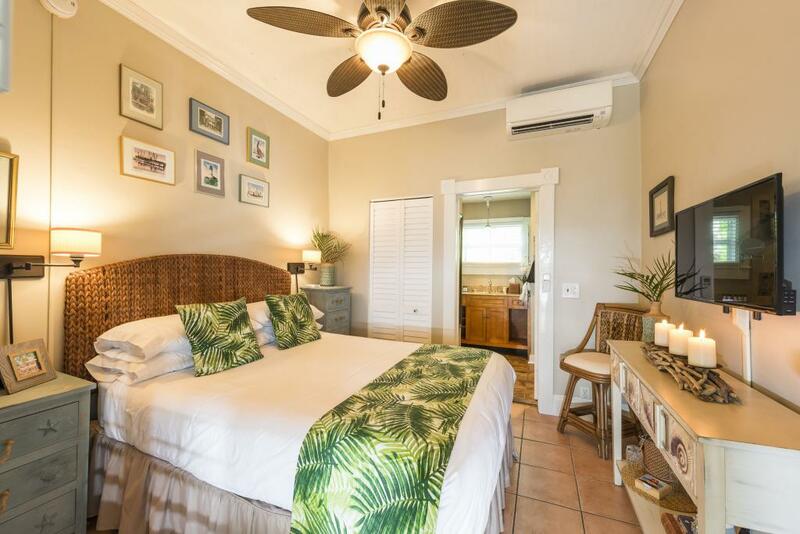 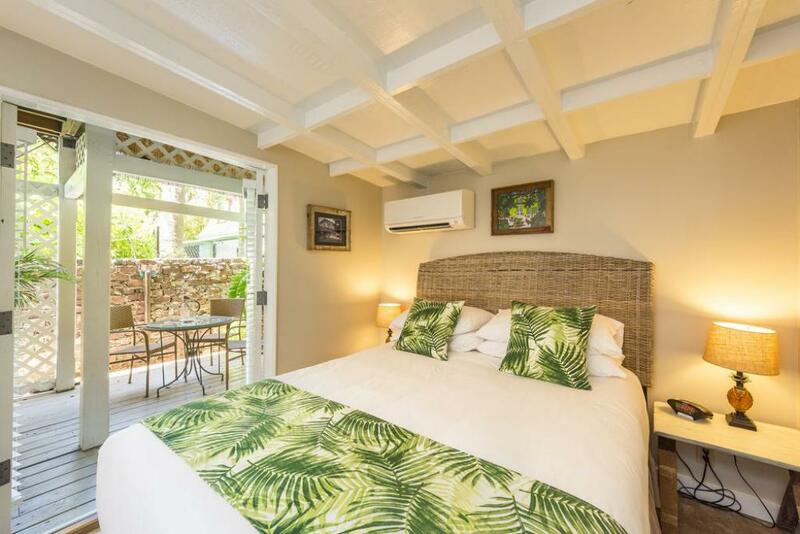 Andrews Inn offers 6 guestrooms and 1 off-site self-catering vacation rental house. 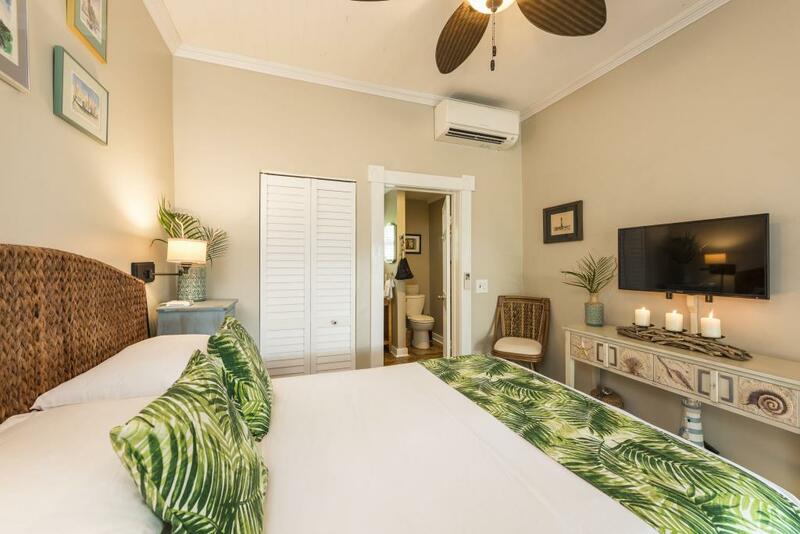 All guestrooms include air conditioning, fans, free high speed wi-fi, flat screen LCD TVs, bar fridges and luxurious amenities. 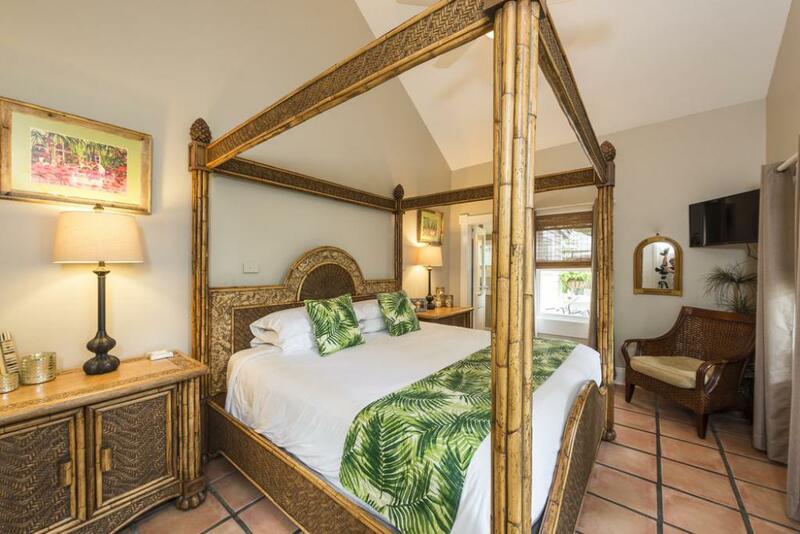 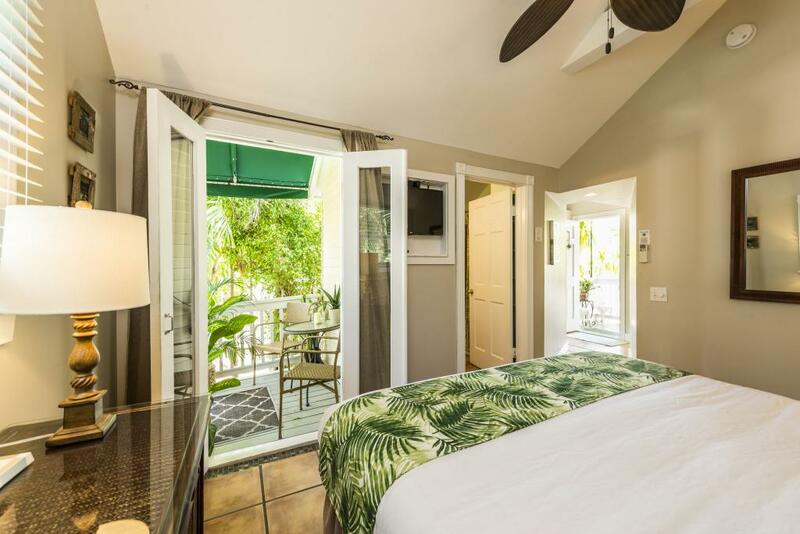 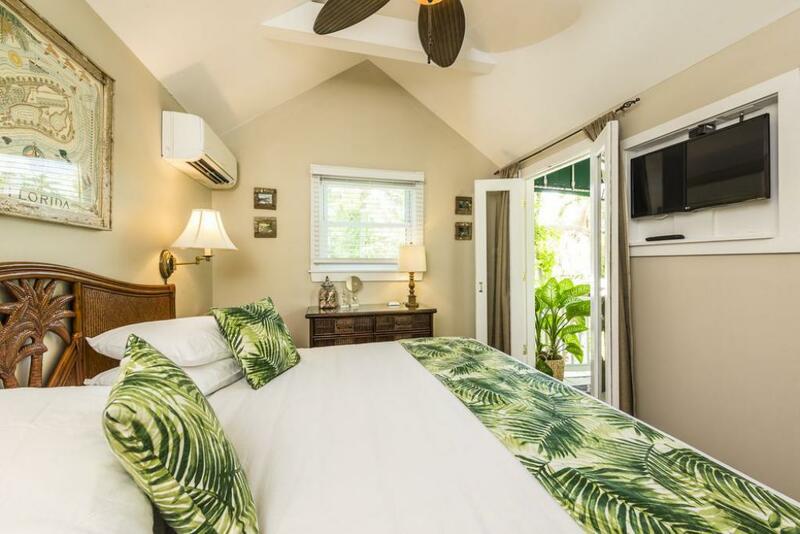 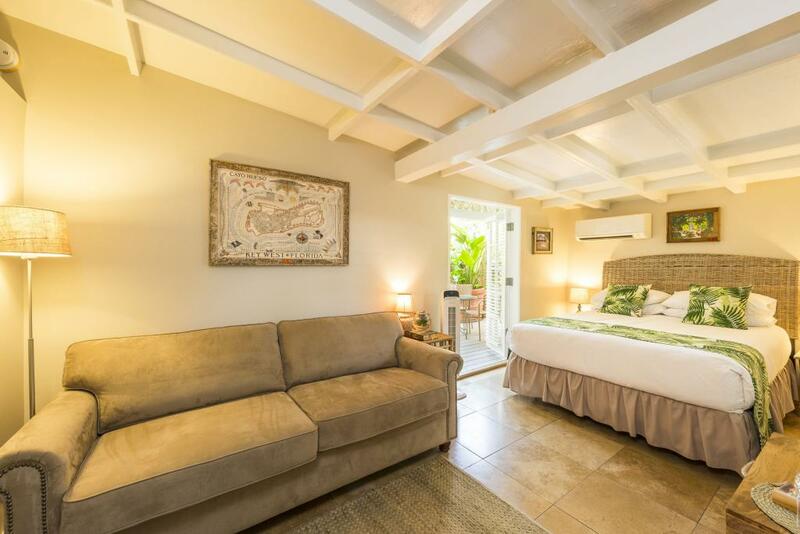 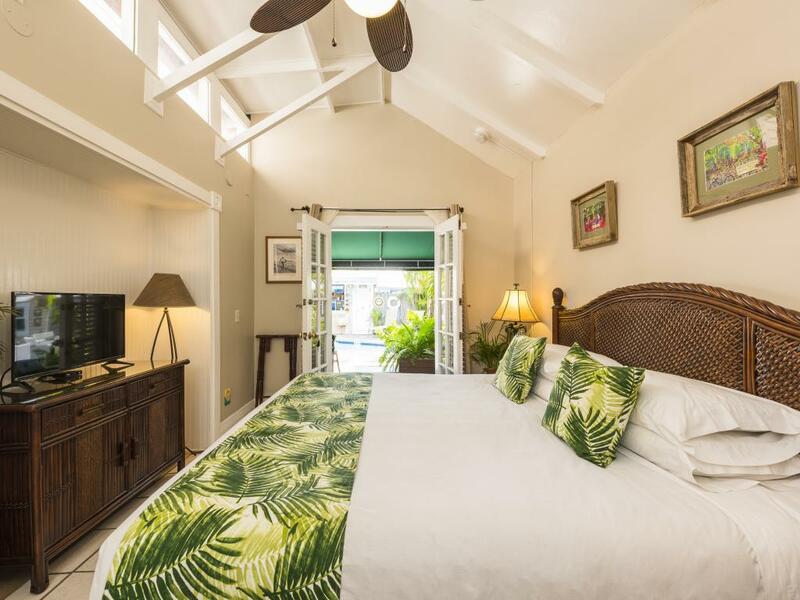 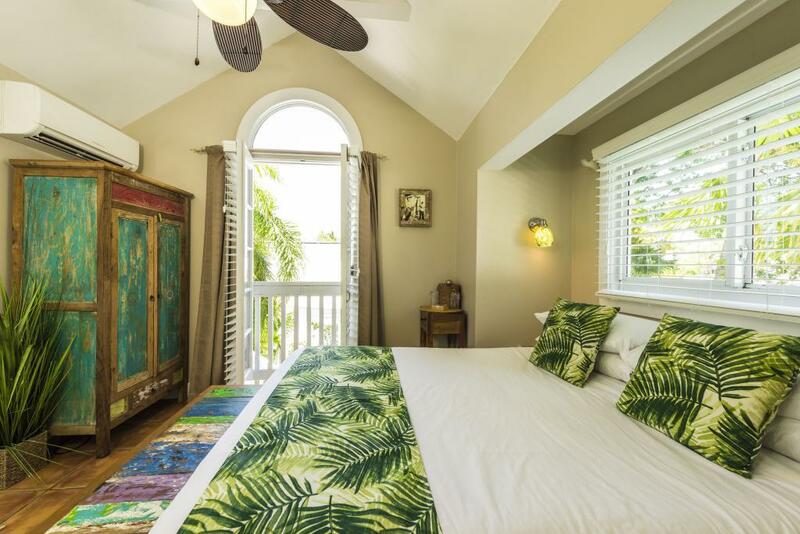 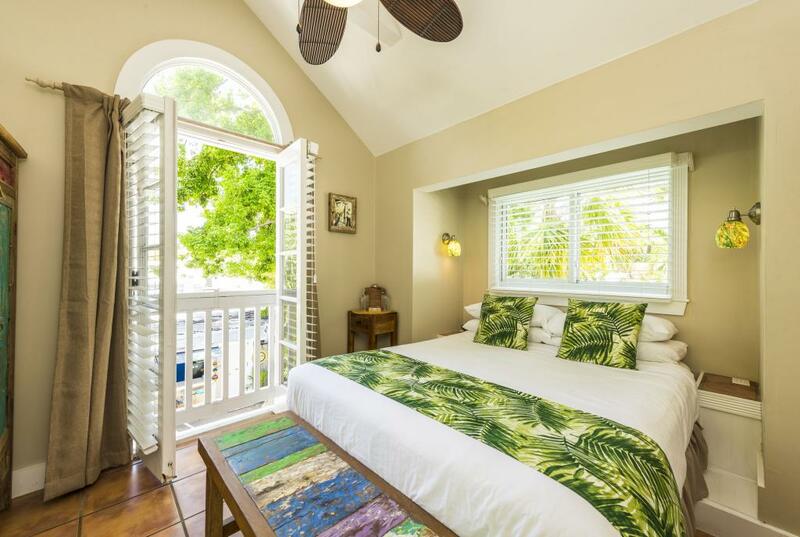 Each room stays true to the traditional Key West design, having laid-back, Bahamian feel enriched by local artwork. 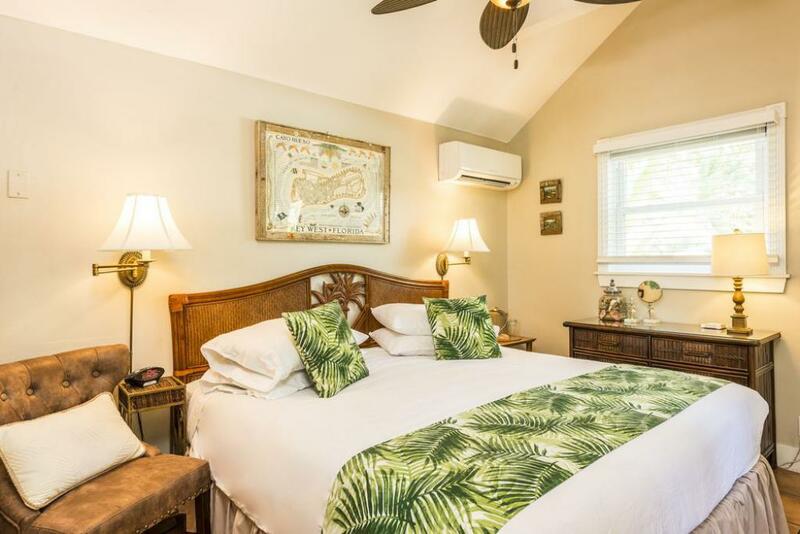 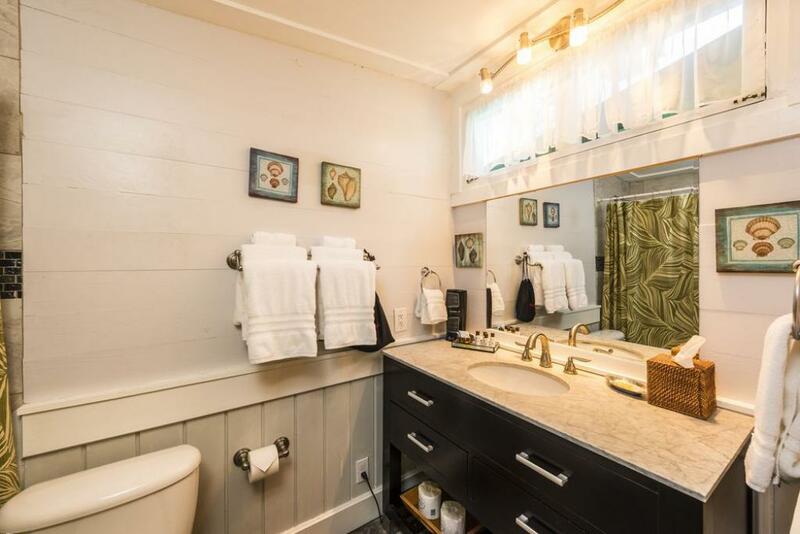 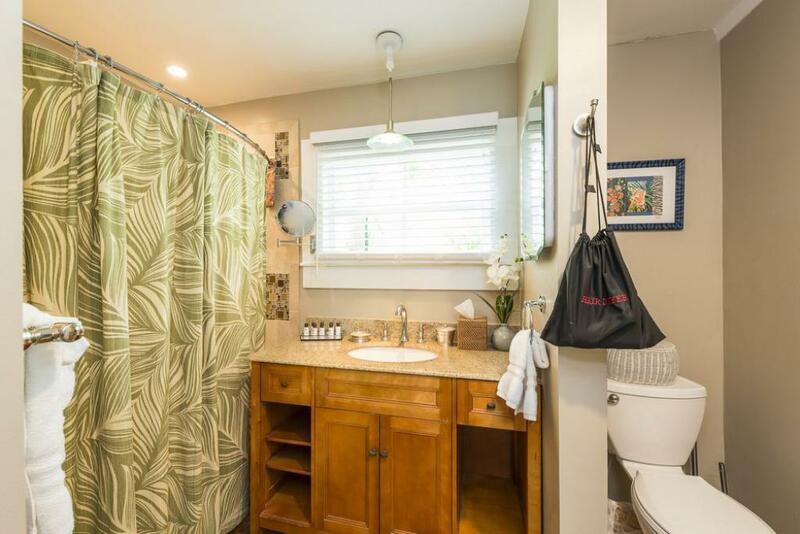 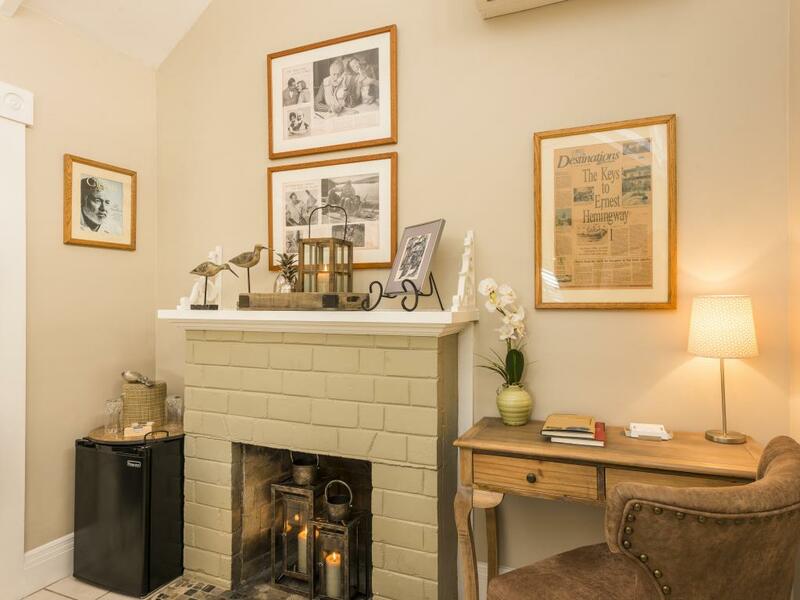 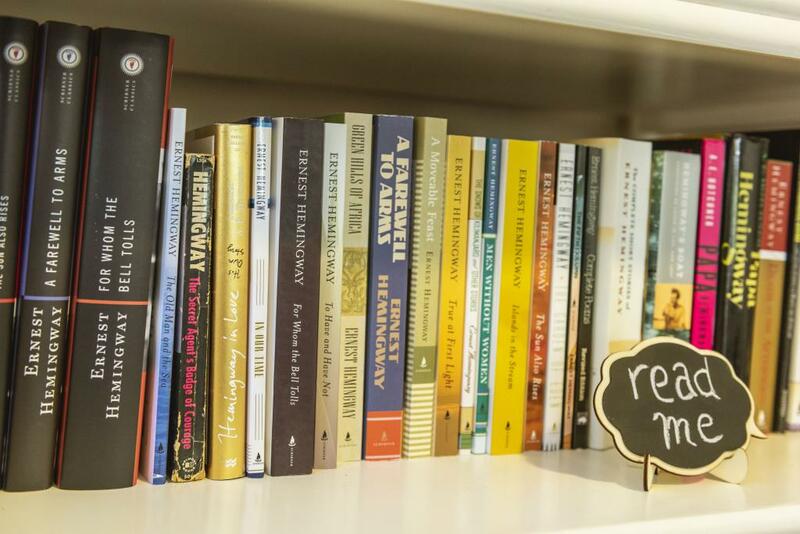 You will find yourself completely at ease staying at the Andrews Inn with your accommodating hosts making sure that your stay is a memorable one. 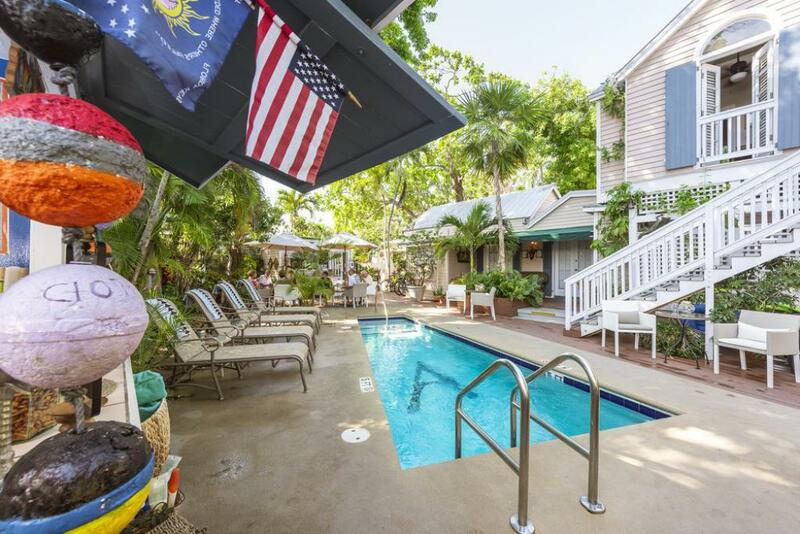 1) From Florida City – Take U.S.1 (south) all the way to Key West – 125 miles. 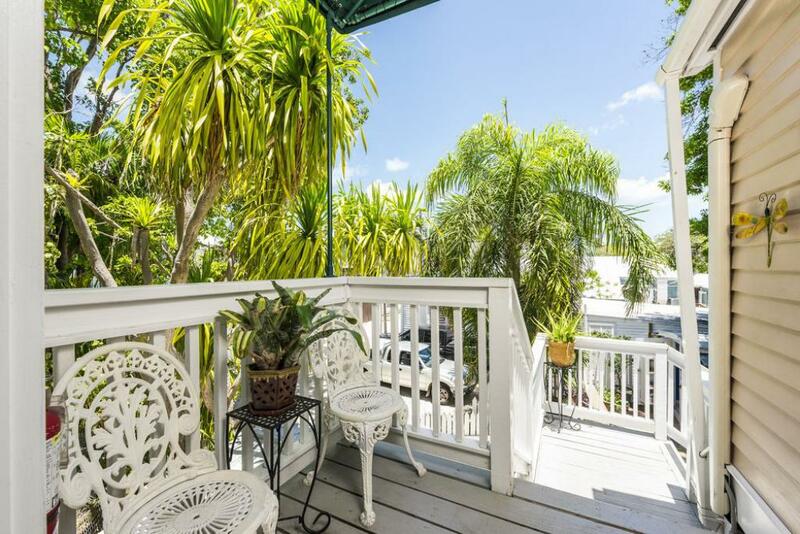 2) Upon arrival into Key West – continue south on U.S.1 bearing to your right (this is also Roosevelt Blvd). 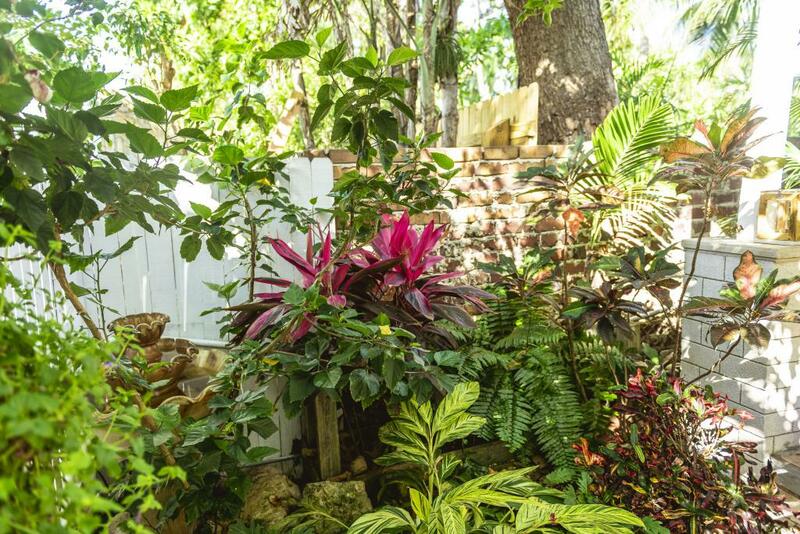 3) Approximately 3 miles – U.S.1 will also become Truman Avenue, now you are entering the Historic District. 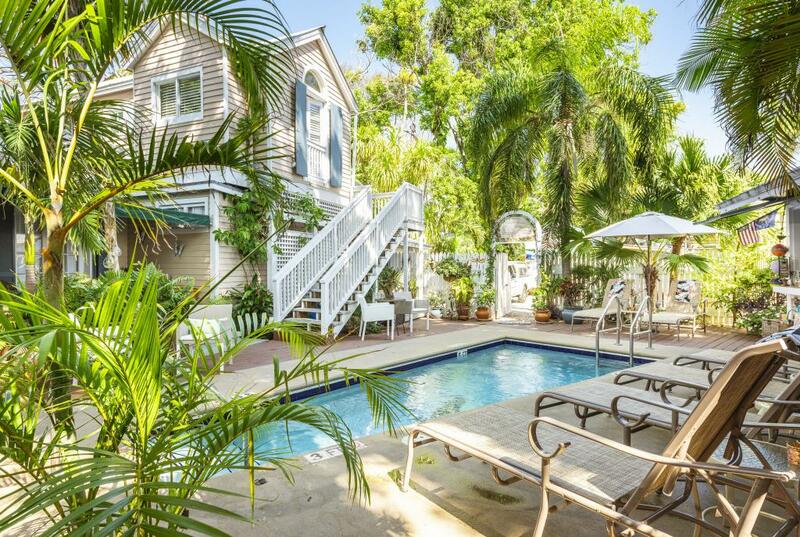 4) 1 mile south on Truman Avenue you will come to the intersection of Duval Street, make a right on Duval. 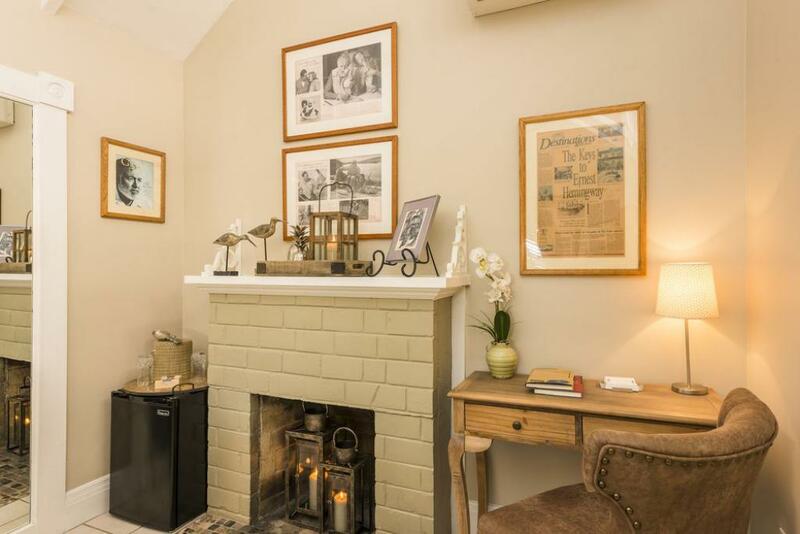 5) 1/2 block to your left you will see Whalton Lane, turn left and follow the lane to the end.